This is one of a collection of watercolours by the artist and antiquary Jane Ann Wright (1842 – 1922) in the Stirling Smith collections. She and her sister Isabella Murray Wright lived in Livilands and then Melville Terrace. They were part of an extended old Stirling family, who were historically Jacobite supporters and worshipped in the Episcopal church, and who were regularly invited to all of the big house parties held by their relatives in the county. 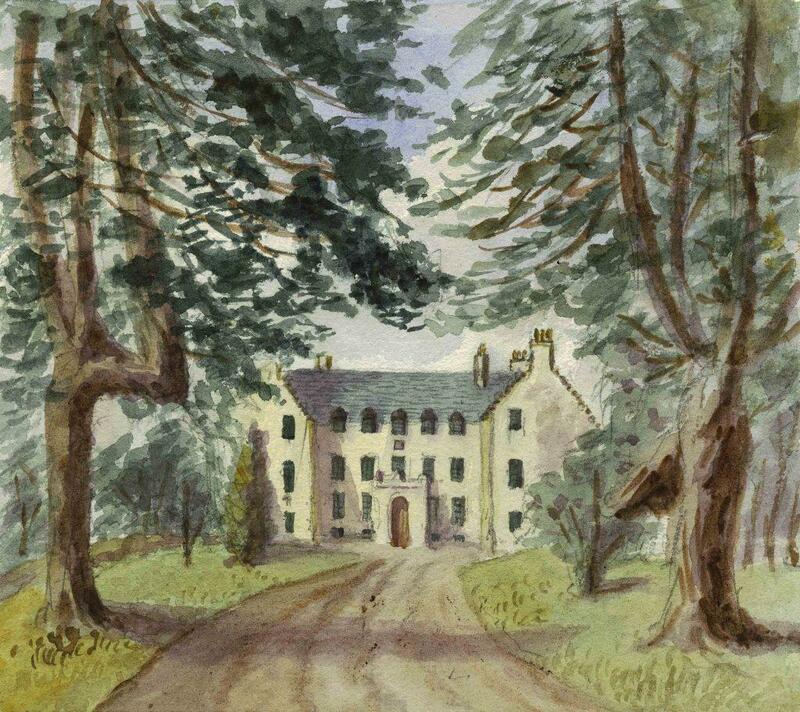 Jane Ann Wright’s record of the country houses of Stirlingshire is important from the architectural point of view, and in some cases, is the only record of particular properties. This work was painted around 1890 when the house was owned by the Wilsons, who made many alterations and enlargements to the house; such as the new porch entrance and extension to the library. The Wilsons were the main employers in Bannockburn where their tartan mills served a worldwide market. In 1746, the Disarming Act had forbidden the weaving and wearing of tartan in the Highlands. Ironically, Bannockburn, from where Charles Edward Stuart had managed to gain his victory at the Battle of Falkirk, 1746, was technically in the Lowlands and the village reaped the benefits. Bannockburn should not suffer the fate of Polmaise Castle and Murrayshall, and the restoration programme is a worthy one.